When I was a young kid, I dreamed of becoming an aerobics instructor. I idolized Jane Fonda, tagged along with my mom to Jazzercise each week, and begged for Get in Shape Girl sets each birthday and Christmas (which, in my case, are one and the same!). Children of the '80s: Any other GISG fans? Get In Shape Girl lost its appeal to me around, I dunno, adolescence. But in recent years, my love for fitness-related gifts has been rekindled! Now that my kids are a little older, I absolutely love giving them gifts that get them off their cute lil’ butts, and sometimes even into the kitchen. Some of these gifts have been so well-received that I've given them to other little ones in our life. In the spirit of the holidays, I'll share my secrets ;). Here are 7 RD-approved suggestions for wellness-related gifts for young kids (think 10 and under). 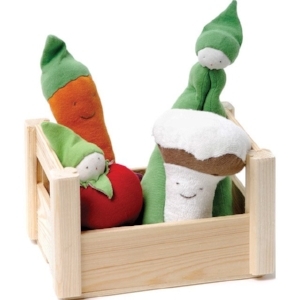 Send the message early on that veggies are fun to eat with this adorable teething set! Babies will love the smiling faces and the bright colors. Caregivers will love that these teethers are soft, easy to grip, and machine washable. Fresh Organic Fruit Basket ($36) also available. 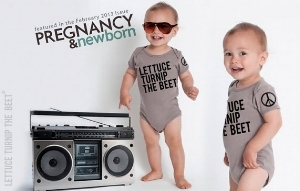 Let your babes proclaim their love of veggies to the world! From my experience, people love starting up conversations about this darling onesie (which is also available in older kid and adult sizes, if your kids aren’t mortified by the prospect of dressing like their parents yet). Santa has brought each of our three kiddos a LeapBand over the years. The kids love it because it encourages silliness and creativity, using animal movement challenges and other fun games. I love it because its customizable controls allow parents to limit access during school and at bedtime. Parents can also set daily usage limits. MaeMae, using her Learning Tower to make "Carrots a la MaeMae"
Yes, it's expensive. But this tower is a workhorse. We bought this more than 6 years ago and it's still going strong. Our kids started using this as young toddlers for water play at the sink (which is fantastic when you have a busy little one and need to get dinner on the table). But it's still useful for older kids. Our 5-year-old can't quite reach the stove and countertop safely when cooking, and this tower provides just enough of a boost. Do you know what's terrifying for a mother? Letting kids play with knives! The best protection against cuts and kitchen accidents is teaching proper knife technique. But these gloves offer some extra reassurance that precious little digits will be safe. They're a great stocking stuffer for kids who've graduated to adult knives. Let's just say you don't yet trust your kids with grown-up knives (even with cut gloves). This set teaches knife skills in a safe and age-appropriate way. 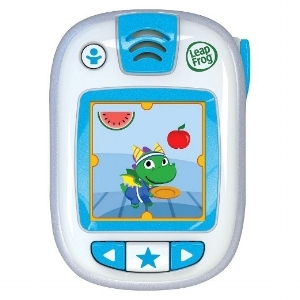 My son started using these just before his second birthday, and he happily sits at the table (or stands on his Learning Tower!) with fruits, vegetables, herbs, and cheese so he can help make dinner. Full disclosure: They're not great for crunchier foods, like carrots. Think cucumbers, berries, bell peppers, peaches, etc. Have you ever coveted your kids' toys? I secretly get kind of jealous when I see my kids play with their Teeter Poppers. They just look so fun! Younger kids can sit and rock in their poppers, while older ones can stand and twist. In the process, the kiddos build up balance, as well as core and leg strength. What about you? Have you found any awesome wellness-related kid gifts this season?